Your bunny needs to go to a vet yearly for routine health check-ups. It is also important to start establishing a relationship with a vet so that if an emergency arises you know where to go and your vet will be familiar with your rabbit. Veterinarians should be specially trained to work with rabbits and other small animals. 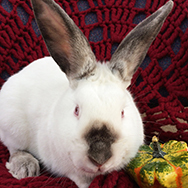 The following is a list of veterinarians in Milwaukee and Ozaukee County who are recommended by the House Rabbit Society because they specialize in rabbits. If you have questions regarding products and supplies, call (414) 431-6222.